Happy holidays once again! It’s been an interesting year for DVDs and one of the most satisfying for Savant, mainly because more studios have been digging deeper into their libraries. MGM was doing this two years ago, but appears to have slowed down their vault exploration somewhat. Paramount has committed to a steady stream of bare-bones but quality series of library titles, while Fox has its Studio Classics line as well as healthy library picks from the past. The happiest surprise is Warners, where a new executive in charge (or in an advisory capacity) has finally steered the label into the older Warner and RKO libraries. They’ve already brought out a fat list of fancy two-disc sets, and every month they announce more beautifully restored classics. The minor leagues (or non-conglomerate companies) are still as busy as ever. Criterion is well into their 200+ spine numbers and has been joined by Home Vision Entertainment in bringing out new surprises every month. Anchor Bay is still making their special editions some of the best on the racks, joined this year in a big way by Blue Underground. Image has nice surprises every month or so, thanks to distribution deals for Milestone, a label that, with Kino, seems to have the arcane classic market sewn up – rare films in excellent restorations. And don’t forget the microbrewery All Day, which maintains as a pocket of brilliance for totally wild releases like Christ in Concrete. So, on to Savant’s pick discs for 2003. It’s sort of a ten-best, but really a grab bag of my personal taste, the titles that had the most meaning for me, for various reasons. I certainly wouldn’t tout them as a ‘Best Of’ list … We have enough of those at the Online Film Critics Society, lists that are so hard to choose and not look like a total fool. Asked to come up with a ‘Best Unheralded Picture of the 90s’ last year, my first and most emphatic choice was Wim Wenders’ Until the End of the World. It came in dead last. Either my fellow Socialites forgot about it, or hate it, or both. So much for my chance of ever getting elected to public office! There are ten movies picked here, but they’re accompanied by 50 more titles, many as worthy or perhaps moreso than the top folks. Some are by themselves at the bottom of the list, but they’re just categorical orphans and not lesser by any stretch. If you want to get technical, the top titles with their boxes represented are the ‘winners’, the ones I’d grab if you put a gun to my head. The list is selective, honest. I reviewed over 300 movies this year, and saw a lot more that I didn’t review. So here’s the list that really got Savant’s blood circulating. Remember that this highly subjective list grades the movie experience equally with the extras and special-ness of special editions. With a couple of exceptions they’re all good movies in addition to being ‘special’ for one reason or another, so if you’re looking for blind recommendations, here’s Savant’s picks. You can decide how blind Savant is later. Let’s start with startling restorations. 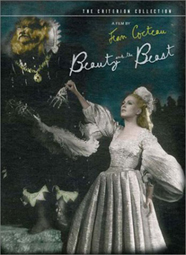 I thought I’d never see Jean Cocteau’s Beauty and the Beast looking this good. I know people who had just found the old release on EBay, who then turned around and grabbed the new one. Film restoration + digital cleanup makes these rare titles shine as never before, and in the case of this classic fairy tale, I’m sure it looks better than the first import prints seen in America. From Criterion, still the discriminating DVD label of choice. Other companies have been just as busy, bringing out rarities in splendid versions. Milestone & Image teamed up for a restored Michael Powell epic, The Edge of the World, and a definitive two-disc set of a silent and part-talkie Lon Chaney The Phantom of the Opera. Over at MGM, restorers like John Kirk and James Owsley put the censored ending back on Kiss Me Stupid, reinstated missing head-choppings and ‘nasty bits’ to Hammer’s The Vampire Lovers, and (with a major assist from the BFI) resurrected the rumored-lost 1933 The Ghoul with Boris Karloff. It must have been hidden in a corner of the BFI vault, tucked away beneath the Arc of the Covenant. Blackhawk and Image gave us many a David Shepard labor of love, including a socko double bill of Buster Keaton’s The General + Steamboat Bill, Jr. in excellent condition. Finally, Fox gets the prize for most-improved major studio release with their sparkling reissue disc of All About Eve. My next most treasured title from 2003 is from Paramount. 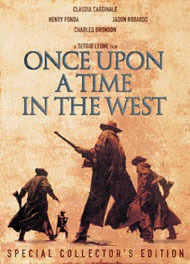 Once upon a time we dreamed of having Once Upon a Time in The West on DVD, and it’s finally come to pass. Dastardly Henry Fonda and stoic stone-man Charles Bronson circle around one another with Ennio Morricone’s electric guitars for a wailing background, in a Western that verges on mythological legend. The fancy Region 1 release retains the impressive extras assembled for the English market. They’re truly lavish, especially the long docus shot across Europe and America, and authoritative input from Sir Christopher Frayling. The Fox Studio Classics disc set of John Ford’s My Darling Clementine technically doesn’t hit until early January, but I’m bending a rule to include it here because it’s so close at hand and will seem so remote come next December. It contains two versions of the 1946 classic oater, the one where Earp kisses Clementine, and the one where they shake hands (and about 50 other differences as well). Scott Eyman provides the good-listen of a commentary for this one. Universal came out with a whole series of Westerns last spring, the most interesting of which is still the first Anthony Mann-James Stewart collaboration Winchester ’73. It reshuffled the genre deck for the 50s, and redefined star deal making in Hollywood too. MGM‘s disc of Wim Wenders’ Wings of Desire gets the next nod. Here’s a modern classic deserving of A+ treatment. The exquisite B&W filming segues magically into color for a few scenes, and the mournful cello score contrasts well with the Nick Cave rock in the final third. Wim Wenders provides terrific commentary on the extras, which include extensive outtakes, explanations of how they invented the angels’ M.O., and how surprised they all were when the Berlin Wall came down scarcely a year later. When MGM commits to a title, they really do a great job. The Wenders film isn’t purely a romance, but there were a number of great discs out last year that were. Fox‘s Studio Classics return to The Ghost and Mrs. Muir presented the peerless fantasy romance with a beautiful picture, and a crystal clear recording of one of Bernard Herrmann’s best scores. MGM‘s Avanti! rescued an overlooked Billy Wilder classic with brilliant color and an enhanced image, as Juliet Mills pursues Jack Lemmon around Ischia to a medley of Italian standards like Senza Fine. Anouk Aimée and Marc Michel cavort inWellspring‘s DVD of Jacques Demy’s Lola, a stylistic prequel to The Umbrellas of Cherbourg. The disc has mild quality issues, but is another romantic delight. Also not 100% in the quality department but too charming to ignore is MGM‘s disc of Wilder’s The Private Life of Sherlock Holmes, a nostalgic adventure that puts the consulting detective into a romantic bind. Here, it’s the Miklos Rosza score that weaves the magic spell. This gem is one you most likely have not heard much about. 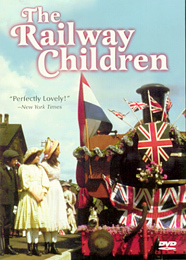 Early last year, Anchor Bay quietly brought out a disc of Lionel Jeffries’ The Railway Children, a so-called family film that’s an intelligent charmer for all ages. A young Jenny Agutter leads her impoverished brother and sister on a quest to find out what happened to their father and to restore him to the family. It’s pleasant, thoughtful, and beautifully made. For a different kind of family adventure, there’s Columbia TriStar’s Nowhere in Africa. The 2001 picture charts the completely unpredictable adventures of a Jewish family that narrowly escapes the Holocaust in Germany, only to find themselves enemy aliens in their newly adopted Kenya. Merab Ninidze and Juliane Köhler are terrific under Caroline Link’s direction, and the film is an adult adventure without a single predictable scene. This year warrants a special ode to Warners, which continued their classic line with great single-disc shows and two disc special editions. 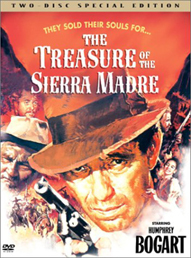 John Huston’s The Treasure of the Sierra Madre, just one great-looking Warners disc of many, is the one that lingers most in the imagination. B. Traven’s adventure curdles into a dark tale of greed and murder with a cynical kicker at the end. Humphrey Bogart, Walter Huston and Tim Holt never looked better and Max Steiner’s score has that brassy Warners studio orchestra sound. This double decker disc has more than one docu and a long biographical piece on the controversial director. There are even more 2003 winners from the Warner stable, but the ones Savant couldn’t resist were Mildred Pierce, with Joan Crawford creating her best role; Casablanca, an obvious shoo-in that still dazzles with its silvery B&W sheen; The Adventures of Robin Hood , perhaps Warners’ best color restoration so far, and a double disc set that includes a full isolated Erich Wolfgang Korngold score; and To Have and Have Not, the Bogey-Bacall Hemingway adventure feature that renewed Hollywood’s ability to create love-at-first-sight legends. Warners has a huge library of classics to exploit and gets top marks for presentation. Errol Flynn for ’04, anyone? Rediscoveries sometimes trump restorations, because of the marketing courage required to launch a really obscure title. 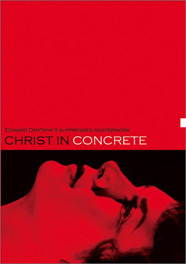 I had never even heard of Edward Dmytryk’s Christ in Concrete, and seeing All Day‘s disc was like finding a new favorite. Pietro di Donato’s landmark humanist book is social criticism from a blacklisted writer and director, set in a convincing New York but filmed entirely in London. All Day’s extras include docus and a commentary where host David Kalat has to keep a lot of emotional participants on track – this political film still raises emotions 50 years after it was made. Other discs also stood out as minor miracles, just for being released. Kino International deserves some kind of silent movie appreciation prize for their disc of Paul Leni’s The Man Who Laughs. It’s a grotesque classic that predates the look and morbidity of the great Universal horrors of the thirties, and it has terrific performances from Conrad Veidt and Olga Baclanova. Image distributed Ruscico’s gargantuan epic, the Soviet version of War and Peace. It took five years to film and seems to have expended every Russian resource not committed to the Cold War. The battles feature real armies that stretch to the horizon and the dramatic highlights are impressive in a very ‘Soviet Cinema’ tradition. Criterion makes the grade again with William Dieterle’s The Devil and Daniel Webster. It’s technically a restoration to original length, but the new scenes change the tenor of this diabolical fantasy enough to seem an entire new picture. Walter Huston is the inimitable Mr. Scratch, the Yankee devil with a mischievous grin. And finally, it’s back to Kino International for a revelation disc that isn’t for all eyes, and will probably not make too many Best-Of lists. Hell’s Highway: The True Story of Highway Safety Films is a sometimes difficult-to-watch docu on those gruesome scare movies shown to kids in the 50s and 60s, like Signal 30. Bret Wood has given his all to the tough task of explaining how they came about and where they were shown. It’s a brave explorer in uncharted docu regions that succeeds by approaching its subject with extreme civility. 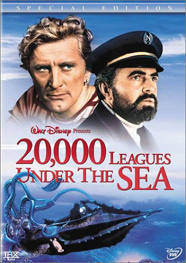 A movie I definitely knew about, but had almost given up waiting for on DVD, is Disney‘s first CinemaScope live-action feature 20,000 Leagues Under the Sea. Perhaps a little slow, it’s still a majestic work of the imagination and a brilliant showcase for what the best studio resources could accomplish in 1954. The Nautilus is one of the best movie designs ever, and James Mason is a superb hero-villain, a 19th-Century terrorist. With exhaustive extras, including BTS footage of the first abortive giant squid concept. Fox followed up with its own Jules Verne concoction, 1959’s Journey to the Center of the Earth, a light-hearted adventure difficult to dislike. Even Pat Boone is charming in a leading part. Naturally, James Mason is back again, and we only wish his later roles were as good as this one. With ponderous, Earth shattering (and bass shattering) Bernard Herrmann music. And don’t forget Gertrud, the movies’ most famous Duck du Jour. This was a harder category to decide upon, simply because all the films here are emotional favorites. 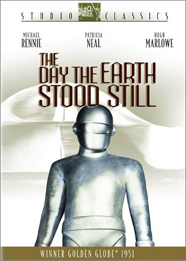 I finally settled on Fox‘s The Day the Earth Stood Still simply because it represents the finest qualities in in classic 50s Sci-Fi, not because it’s the best-looking disc or the most lavishly appointed. Most of its extras come from an older laser disc set that cost $60 or so in 1995. Klaatu’s mission to Earth has always been interpreted as benevolent pacifism from Outer Space, which is insane considering just what kind of totalitarian dictatorship Klaatu’s galactic syndicate is pushing. I get into it all in the original review; it’s a sublime film any way one looks at it and Fox’s disc is immaculate. Warner kicked in with a lot of great fantastic product this year. Their The Beast from 20,000 Fathoms, Ray Harryhausen’s first solo effort, is another clean transfer that appears to be made from elements improving on the earlier laser disc. Their combo disc of House of Wax + Mystery of the Wax Museum makes possible a direct comparison of two versions of the same story, the Lionel Atwill / Fay Wray 1933 version, and the later color remake that made a horror star of Vincent Price. Another 2003 double bill from Anchor Bay that spun Savant’s head around is Dead of Night + The Queen of Spades. These two British films are considered key horror classics; the first isn’t of stellar quality but its omnibus of horror tales are still chilling. The second is a rare & exotic story of greed and the supernatural. With that we return to Warners once again for another Harryhausen hit, 1969’s The Valley of Gwangi, a fanciful dinosaur-vs-cowboys monsterama that scores with several show-stopping animation scenes, and a great Jerome Moross score. The score’s also the thing with Francois Truffaut’s compelling Universal disc, Fahrenheit 451, a Ray Bradbury thriller easier to appreciate on this superior DVD. Finally, wrapping up the category is one more Warners offering, 1951’s original version of The Thing from Another World. The transfer is surprisingly soft, but the audio is good and it’s the longer version that includes all of producer Howard Hawks’ character scenes. Savant’s always been a soft touch for crime films and films noir, yet finding really good transfers of classic titles isn’t easy. Unless Humphrey Bogart’s in it, many of the best are still MIA on DVD. 2003 gave us a good list to ponder. 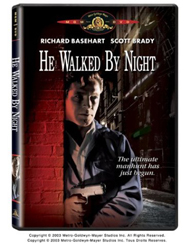 MGM takes top honors with its budget release of a 1948 Eagle-Lion film, He Walked by Night. This unassuming public domain show looks sensational, with John Alton’s classic noir lighting beautifully rendered in delicate B&W. Richard Basehart is a calculating criminal mastermind who evades the LAPD by various means while killing policemen and maintaining a robbery reign of terror. His all-purpose escape route eventually becomes a trap, and the hardboiled police procedural format becomes a more existential piece about an alienated public enemy. There was no shortage of great thrillers to choose from this year, noir and un-noir. Columbia TriStar‘s romantic Nicholas Ray classic In a Lonely Place puts Humphrey Bogart and Gloria Grahame at the center of a web of suspicion and persecution. Criterion flattered us with a knockout double-bill of the two Universal pix based on Hemingway’s The Killers from 1946 and 1964. The first picture launched Ava Gardner and Burt Lancaster, and the second helped define Lee Marvin as a hipster with a silenced revolver. Criterion struck twice more, with the erudite but malevolent thriller about a woman scorned, Les Dames du Bois du Boulogne written by Jean Cocteau. They also put out a definitive Polanski, Knife in the Water a drama that threatens to become a thriller or murder story. It comes with a string of Polanski’s acclaimed student and independent short films. Home Vision Entertainment made its mark with a 2000 French film that borders on Grand Guignol, the chilling Murderous Maids. And rounding out the category takes us back to Criterion again, for a lavish special edition of Leonard Kastle’s The Honeymoon Killers with Tony Lo Bianco and Shirley Stoler. 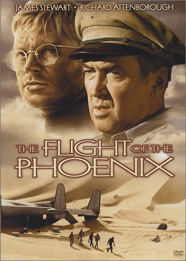 Savant’s a sucker for adventure films, and Fox came through in 2003 with a favorite that until now has only been seen in grainy cable TV versions, Robert Aldrich’s Flight of the Phoenix. It’s a great character study of men under pressure with James Stewart, Richard Attenborough and Hardy Kruger leading a large, all-male cast marooned in the Sahara. And it has Connie Francis (well, her voice) singing Senza Fine, so who can complain. Fox’s DVD has no extras but makes up for it with a (finally) accurately letterboxed transfer. Vying for first place in the category was another Fox offering, Sink the Bismarck! It’s a standard tale of action on the high seas done way before CGI. Its giant Lydecker miniatures are photographed so well, you want to applaud. Kenneth More and Dana Wynter strategize beneath Whitehall as a few of Britain’s warships take on a vastly superior battleship foe. In great B&W ‘Scope. Also in B&W and Panavision is the much maligned Rene Clement film from Paramount, Is Paris Burning? With its stirring Maurice Jarre music and choice of English or French soundtracks, this is a stunning thriller with the city of Paris as its central heroine and every prominent French actor of the day in a supporting role. Those are the main titles that seemed to fall into neat categories, which leaves Savant with a bunch of worthy DVDs that are, well, too worthy to dismiss. They’re an odd cross-section of tastes and genres. Instead of being listed in a preferential hierarchy as the titles above, these are simply alphabetical. Criterion‘s The Adventures of Antoine Doinel: The 400 Blows, Antoine & Colette, Stolen Kisses, Bed and Board, Love on the Run is a giant box charting Francois Truffaut’s four and 1/2 features with star Jean-Pierre Leaud from adolescence to adulthood, accompanied by docu extras to help us decide to what degree the shows are autobiographical. Image knocked us out with a flawless transfer of a schlocky 1957 Bert I Gordon film, Beginning of the End. The high quality and the commentary hosted by Bruce Kimmel make this too attractive to get snooty over; this saga of giant grasshoppers is irresistible, drunk or sober. Fox‘s How Green Was My Valley is possibly the best all-round picture from the whole year, a John Ford masterpiece that wins converts of whoever can be tricked into seeing it. It’s another of the Fox Studio Classics line. Home Vision Entertainment surprised us out of the blue with Carol Reed’s A Kid for Two Farthings, an eccentric Wolf Mankowitz parable about life as lived in a London market street where a large cast of characters live out interlocking stories of hopes and failures. A little boy becomes convinced that a deformed one-horned goat is a mythical unicorn that can grant the wishes of all. A snappy picture in excellent color. MGM finally dared to bring out George Axelrod’s insane black comedy about the bizarre world of 1960s Los Angeles, Lord Love a Duck. Tuesday Weld goes orgasmic over cashmere sweaters (“Pink Put-on! Papaya Surprise!”), ex-child star Roddy McDowall is a symbolic character called the Mollymauk, and the satire ranges from murderous females and drive-in churches to LA’s prime gift to modern culture, Beach Party Movies. Full of suggestive and twisted humor, noxious rock music, and shimmying bikini’d rumps. Anchor Bay‘s DVD of Nicholas Roeg’s Sci-Fi parable The Man Who Fell To Earth finally gives us a quality presentation of the cold and mournful story of David Bowie, the soul-sick Alien who comes to our world only to be victimized by corporate greed. Columbia TriStar scores with another parable, John Sayles’ political-humanist look at Latin American terror states in the frightening Men with Guns. Only Sayles could make such a subject watchable, and even beautiful. Warner‘s Once Upon a Time in America is Sergio Leone’s last film, a brilliant but off-putting gangster saga that alienates more viewers than it charms. This film festival version is even longer than a previous restoration. Robert de Niro and James Woods are great, but the honors go to Ennio Morricone’s stirring score. BBC/Warner brought us the legendary British TV miniseries The Singing Detective, the one about a pulp writer’s slow recovery from a horrible skin condition. His memories and present situation mingle with the fabricated plots of the stories he’s written, all to a musical background. It’s classic television in an excellent presentation. Criterion can’t be ignored when it takes Federico Fellini’s La Strada, almost always seen in scratchy, dup-y film prints, and restores it to its original 1954 magnificence with a choice of soundtracks and definitive extras. Giulietta Masina, Anthony Quinn and Richard Basehart come to no good end on Italy’s traveling carnival circuit. Criterion strikes again with a definitive Straw Dogs, one of Sam Peckinpah’s most controversial films, and one that still holds up to a lot of scrutiny. His first non-Western feature has a very Western-like confrontation in a rural English town, and culminates in a violent siege on a stone farmhouse. Dustin Hoffman and Susan George star. It’s backed by a great Peckinpah career docu. Paramount gives excellent treatment to what started as a low-budget Roger Corman film, Peter Bogdanovich’s Targets, starring Boris Karloff. Unusually for a Paramount disc, this has a full commentary and an interview short subject where Bogdanovich comes off as a mellowed and modest fellow. Bogdanovich’s original story (goosed by a helpful Sam Fuller) provides a noble swansong for Karloff by comparing two kinds of horror, the old Gothic and the new 60s brand of impersonal Terror. MGM‘s special edition West Side Story combines a great transfer with a thorough docu offering rare glimpses behind the scenes, and audio peeks at how actors Russ Tamblyn and Natalie Wood sounded singing for themselves in playback tapes. With tons of other extras. And Anchor Bay brings up the alphabetical rear with an equally thorough exegesis on an iffy 1979 thriller with a rough production history, Winter Kills. This all-star paranoid thriller (Jeff Bridges, John Huston, Anthony Perkins and Liz Taylor) is too lavish to ignore, and the fascinating docu materials make sense of its bizarre off-on filming. The participants aren’t even afraid to talk about mob influence and drug connections! A beautifully appointed disc that elevates a movie from undeserved obscurity. The DVD market is always going to be coming out with desirable new titles, but ’04 may see the fruition of some less than appealing trends. Thanks to the power of mass-market sellers like Wal-mart (why don’t we just strike the Stars and Stripes and put up their flag?) two studios now split their output between enhanced widescreen releases and flat pan-scan Doofus Discs. There are notions of Hi Def DVD on the horizon, but I doubt studios will back it until they master some Orwellian method of tracking every copy and its use. Those majors that have already released their core library of biggies, are backing down from putting out their more obscure titles, preferring to repackage more mass-friendly movies. What happened to DVD’s potential of turning the world’s movie heritage into a gigantic library where everything is available? And finally, after years of diligent scraping, some of the minors show signs of running out of commercially feasible obscure titles to cult-ivate … we have to assume that if hotly-desired bizarro films exist to be licensed, their owners are holding out for more cash. At least that’s better than being told (hope it never happens!) that decent elements no longer exist for weird treasures like The Horrible Dr. Hichcock. Have a happy holiday … thanks for all the letters, advice, corrections and other opportunities to meet new people with similar interests! This has been a yearly tradition since 2001. Happy Holidays!